Welcome to Alex Shunnarah Custom Knives. I am a custom knife maker who specializes in fine damascus automatic and switchblade folding knives. I make custom switchblades and automatics as a mechanical passion and I'm proud to offer you these damascus switchblade automatic models. 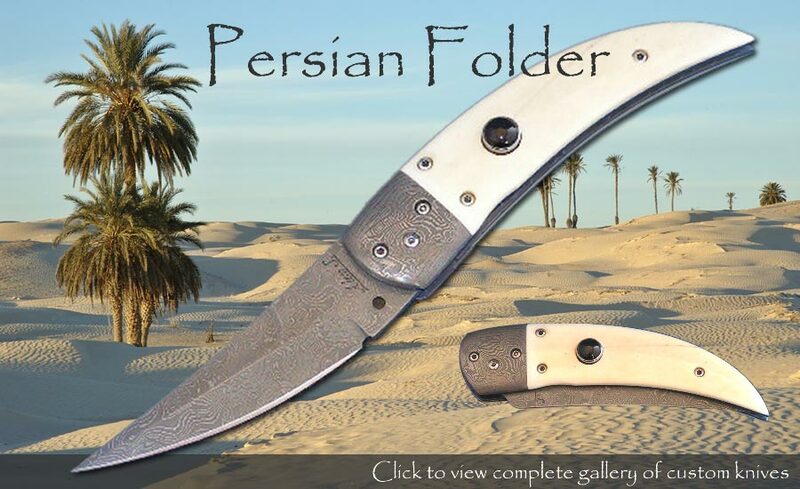 If you're looking for a automatic folder, please see my available switchblade knife gallery using the links above. I'll be more than happy to make you a personal custom automatic using the look and style that you're after. Most of my switchblades are double-action, but I will consider any design you have. I can work with any type of knife steel, including all types of damascus steel. If you're unsure of the exact types of materials and components that will serve your knife design best, please don't hesitate to contact me. We'll work together to make your next switchblade knife the automatic knife of your dreams. I guarantee all of my workmanship for life and I'm proud to call my automatic knife collecting customers, personal friends. If you check the site often, please be sure to stop by my automatic switchblade gallery for many of my custom automatics and switchblades for sale.